This is an envelope the honors former Supreme Court Justice Arthur Goldberg and the 200th Anniversary of the first session of the Supreme Court. The cancellation mark is dated February 2, 1990 with the words "FIRST DAY OF ISSUE" and the stamp pictures John Marshall and says "BICENTENNIAL U.S. SUPREME COURT" and below the portrait "Chief Justice John Marshall." 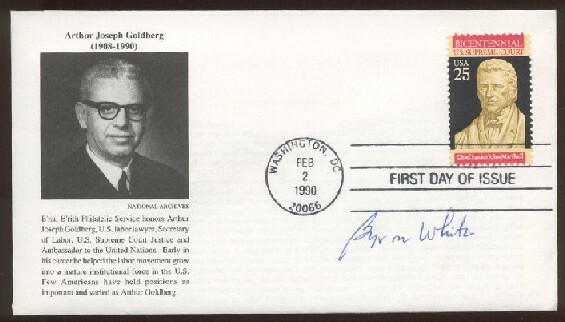 On the left is a portrait of Arthur Joseph Goldberg (1908-1990) and a brief commemoration of his career by the B'nai B'rith Philatelic Service. It is signed by Supreme Court Justice Byron White who with Goldberg were the only two Supreme Court nominations of President John F. Kennedy. It is a very nice item in great condition for Supreme Court, Justice Goldberg or Justice White collectors.